"Group Photo: Bishop Gong Pinmei and Jin Luxian"
Jesuit Group Photo. (Bishop) Cardinal Gong Pinmei with pectoral cross. Golden Jubilee of Bro. Xavier Coupe, SJ. Fr. Jin Luxian, SJ, stands to the right of Gong Pinmei. Shanghai (Xujiahui). B/W Photo. 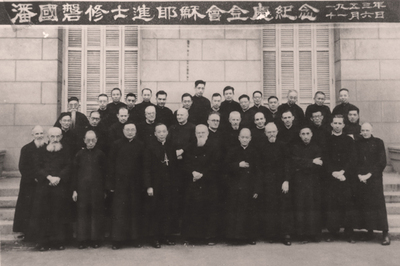 China Province Jesuit Collection.